Valais, boasting mountain megaliths over four thousand metres high such as the Matterhorn and Monte Rosa, with rugged glaciers and wings of ice towering toward the heavens, is not only a paradise for Alpinists but also proves to be an ideal hiking area: above the often narrow and gorge-like valley walls lie the more elevated slopes, covered with a network of trails that are as comfortable to walk as they are meticulously signposted; picturesque Alpine huts scattered over lush meadows and whispering forests, sun-burnt hay barns and sheds lend this striking landscape, embedded in a magnificent setting, a cosy charm. To do justice to the number of walking routes between the Grimsel Pass and Lake Geneva, this area has been covered by two separate Rother Walking Guides: Upper (East) and Lower (West) Valais. 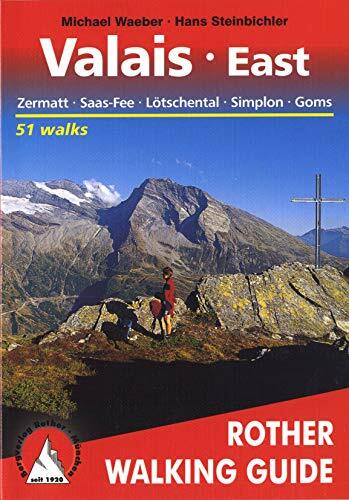 In this volume, "Valais East", completely revised in its 2nd printing, Michael Waeber and Hans Steinbichler, both experienced Alpine journalists and top-notch Valais experts, present 49 day tours in the German-speaking area of the Rhône Valley and in the secondary valleys around Zermatt, Saas-Fee and Fiesch, as well as a six-day circular trek around the Mattertal, and a three-day crossing of the Simplon Pass on the historic Stockalper trail. The second volume, "Valais West", presents 50 walks in the French region, on the other side of the language border near Sion, down to Lake Geneva. For each tour, the environmentally-concerned walker will find information on accessibility via public transport; dining and accommodation opportunities as well as tips on alternative routes are also included. Colour codes are used to grade difficulty which facilitates the selection of tours and the detailed route descriptions, the clearly rendered maps with a scale of 1:50,000 and 1:75,000 as well as the useful height profiles make all recommended tours easily comprehensible. Scores of colour photographs whet the walker's wanderlust.